Amatrol’s Electrical Power Distribution Learning System (85-MT7-B) teaches a broad range of electrical advanced manufacturing skills, such as installing, maintaining, and troubleshooting modern power distribution systems that require skills ranging from setting up basic raceways to selecting appropriate over-current protection for sensitive equipment. The 85-MT7-B includes a mobile workstation with a configurable frame and junction boxes, a bus bar with two bus plugs, lockout/tagout, two motors (5 Hp 3-Phase and 1/3 Hp 3-Phase), and a conduit sample kit with five types of conduit. Learners will study industry-relevant skills including how to prepare, cut, bend, and connect conduit, handle advanced raceways, and select wire sizing and types. This system uses industrial quality components to help learners become better prepared for what they will encounter on the job as well as to withstand frequent use. The 85-MT7-B is arranged so that learners can be presented with a wide array of real-world installation problems found in industrial situations. Learners install a variety of conduit types, size fuses, install bus plugs, and connect motors. Learners will also study how to safely handle 3-phase power. Safety devices, such as safety switches and lockout/tagout locks, help learners develop the safety skills needed to assure safe operation in an industrial environment. The 85-MT7-B’s workstation is designed so that the components can be moved vertically and horizontally. This allows learners to practice setting up a wide variety of applications and configurations. Additionally, the workstation features components on both sides of the workstation for classroom flexibility. Learn About Conduit Benders, IMC Assembly, Conductor Pulling, and More! Electrical Power Distribution covers a variety of topics like conduit basics, conduit benders, IMC assembly, overcurrent protection, and conductor pulling. Specific topics include the function and operation of different types of connectors, steps used to determine bender take up, tools used to bend IMC and rigid conduit, and many more! This course is presented in a stunning, interactive multimedia format. Electrical Power Distribution provides comprehensive power distribution knowledge and enriches it with videos, interactive quizzes and exercises, 3D graphics, and voiceovers of text. 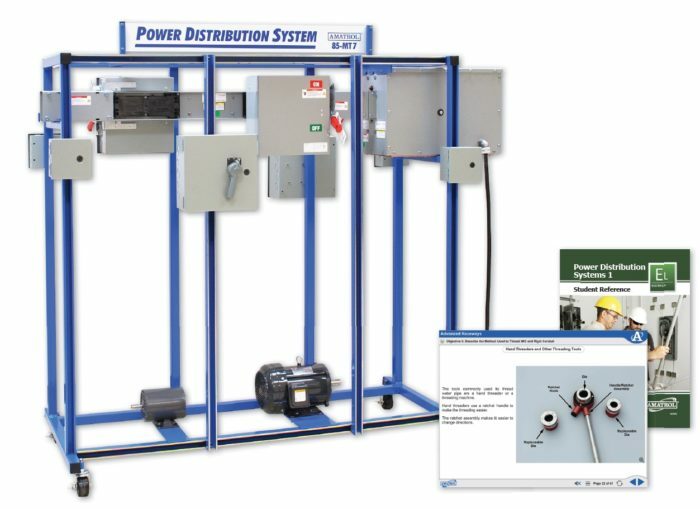 A sample copy of the Power Distribution Systems 1 Student Reference Guide is also included with the system for your evaluation. Sourced from the system’s curriculum, the Student Reference Guide takes the entire series’ technical content contained in the learning objectives and combines them into one perfectly-bound book. Student Reference Guides supplement this course by providing a condensed, inexpensive reference tool that learners will find invaluable once they finish their training making it the perfect course takeaway.